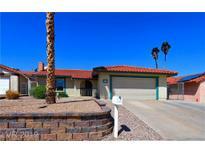 Below you can view all the homes for sale in the Henderson Casa Linda subdivision located in Henderson Nevada. Listings in Henderson Casa Linda are updated daily from data we receive from the Las Vegas multiple listing service. To learn more about any of these homes or to receive custom notifications when a new property is listed for sale in Henderson Casa Linda, give us a call at 702-323-5903. Fantastic price...you can move in quickly! MLS#2085626. Coldwell Banker Premier. One Story POOL Home in Henderson~NO HOA~Three HUGE Bedrooms~One is Perfect for a Mother-In-Law Rm~Walk-In Closets~Lot's Of Parking~Kitchen Features Granite, Island & French Doors Overlook the Back~NEW Tile Floors~Fireplace~Ceiling Fans T/O~Easy Care Yard w/POOL & WATERFALL, Large Covered Patio, Storage Shed & RV PARKING~Heritage Park Just Around the Corner & Features Ball Fields, Amphitheater,Dog Park,Picnic Areas, Aquatic Complex & SO Much More MLS#2080986. RE/MAX Excellence.